Is Cruising Right for Me? "Home" for 11 days. The Noordam in Mykonos. I'm not going to lie. Readjusting to life in Paris hasn't been easy after our 11 day "Ancient Mysteries Voyage" aboard Holland America's Noordam. I keep referring to our bedroom as a "stateroom" and expecting to wake up in Istanbul, Crete or some other sun-drenched location in the Mediterranean. Life has definitely lost some of its luster. And don't even get me started about how Stéphane doesn't bother to wear a tuxedo for dinner anymore, not even when I remind him it's formal night. Admittedly, cruising isn't for everyone but just in case you've ever wondered why 20 million passengers booked holidays aboard ships in 2012, I've tried to answer some of the questions that friends have asked about one of the fastest growing sectors of the travel industry. We like active vacations. Isn't cruising boring? With new ports of call to discover, onboard enrichment classes and nightly entertainment, I've never been bored on a cruise ship. The beauty of cruising is that people can be as active as they want or simply relax by the pool. It's a matter of choice. That's why so many people cruise with their extended families. Mom, dad and the kids can ride mopeds around Mykonos while grandma and grandpa play bridge or learn how to keep their vacation photos organized during an on board digital workshop. At the end of the day, everyone can share their adventures over dinner. Is cruising for older people? While the average age of cruisers is 55.6 years old, cruising attracts people from all age groups and nationalities. During our last cruise, we met families with young children and teenagers, newlyweds, couples whose children had recently left home and quite a few retired Australians and Canadians, who had already been cruising for 22 days when we joined the ship in Athens. It is true, however, that different cruise lines and itineraries tend to appeal to different age groups. When my daughter and I did a five night Caribbean cruise during her Spring Break from university, I was one of the older passengers. Conversely, we decided against doing a Norwegian fjords cruise with our 23 year old son and 25 year old daughter when I learned that there wouldn't be many of their peers aboard ship. If the age of the other passengers is of concern, it's advisable to talk with a travel agent or do some research on CruiseCritic. If you're open to meeting new people, you may discover that some of the most fascinating dinner companions are in their 70s and 80s. We had a very interesting discussion with a retired Armenian man and his wife who immigrated to Australia from Egypt, as well as with many other retired couples onboard. In general, cruisers are very well-traveled people. Are the shore excursions really expensive? They certainly can be if you book them through the ship. That's one of the reasons why we started booking our tours with local travel agencies. Again, it pays to do some online research beforehand. If you decide to book your own tours, be sure that the company will refund your deposit if the cruise line changes the itinerary and that they'll accept full financial responsibility if they don't get you back to the ship on time. When Holland America decided to change the itinerary of our cruise from Egypt to Israel because of political unrest, we could have potentially lost quite a bit of money if we had paid for a non-refundable tour to the pyramids with an independent travel agency. Another advantage of booking a tour with a local travel agency is that you'll probably end up with a small group of people from the ship. That's what happened with us in Israel. After two days touring Jerusalem and floating in the Dead Sea together, we were fast friends. One of the couples from the group even invited the rest of us to their luxurious suite for champagne on formal nights. That probably wouldn't have happened if we had gone on the larger tours organized by Holland America. Will I gain a lot of weight? I don't know. It depends how much restraint you have! With free food at your fingertips 24 hours a day, it's definitely easy to pile on the pounds. After allowing myself to indulge in omelets, pizza, chocolate chip cookies and several trips to the taco bar during the first couple of days, I zeroed in on the healthy options for the remaining days. With Swiss muesli for breakfast, salads and fish for lunch and small-portioned light dinners, I managed to keep my weight under control. It also helped that we visited the gym on sea days and walked a lot while we were on shore. One of the Noordam's spectacular shows featured a couple of Parisian themed songs! Yes, but the shipboard satellite connection is painfully slow and expensive. During the first days of our cruise, I suffered from serious social media withdrawal. It was ugly. But gradually the jitters stopped as I immersed myself in the pleasure of living in the moment. Rather than thinking about my next post, tweet or Facebook update, I marveled at sunsets and interacted with delightful people, including my husband. In fact, Stéphane would probably list the limited internet access as one of his top reasons for going on a cruise. If you absolutely need to stay connected for work or family reasons, watch the daily program for specials. Cruise lines tend to offer reductions on internet packages a couple of times during each cruise, usually on days when most people go ashore. When I had trouble uploading a photo, the internet manager told me that the satellite connection is fastest when passengers are at dinner or otherwise occupied. Don't even think about trying to log on during sea days. It's frustratingly impossible. What's your favorite cruise line? It's hard to say. After cruising with Royal Caribbean, Celebrity and Holland America, we've come to realize that each line has its own distinct personality that appeals to different kinds of passengers. Talk with your travel agent or read articles like CruiseCritic's "How to Pick a Cruise Ship" to determine which line is right for you. During the next couple of weeks, my Paris posts will be interspersed with posts about some of the ports of call that we visited. But for now, I'm going to put on my swimming suit, sunscreen and flip flops. Maybe then I'll feel like I'm still cruising on the Mediterranean. Anchors aweigh! Leaving Athens on the first day of our cruise. Sorry for the unintentionally misleading title, Gwan! Even though I've noticed lots of "Gleeden" posters in the metro since I've returned to Paris, I haven't been cruisin in a long time. Any post that I wrote on that subject would have been extremely dated and very boring! hmmmm, Gwan, I though the same thing too, but MK has always been a little cheeky. What about all those people? Do you ever feel you have an alone moment without staying in your stateroom all the time? The bottom photo just screams "nightmare" to me. Your tips though in general are really terrific. I remember hearing Ivana Trump, of power suits fame, talk about how glamorous it is to go to sleep at night and wake up in a different beautiful location the next morning. I'm so eager to see your other posts. No, it's really not a nightmare crush of people. There are lots of places where you can go on a cruise ship and be totally alone. 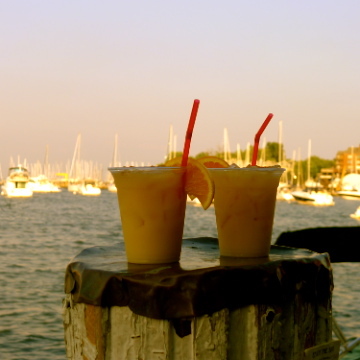 One of our favorite spots was the Crow's Nest bar. It was located on the 10th floor at the front of the ship. We went there a couple of nights to watch the amazing sunsets and to listen to the guitarist. Most amazingly, it was almost always empty. That's one of the things that I like about cruising (not cruisin!). You can be as social or as unsocial as you like. We really enjoyed our times dining and going to shows with other people but also enjoyed time on our own. I think you would like it. Plus, it's really exciting to wake up in a new port in the morning. I get chills whenever I think of arriving in Istanbul just in time to watch the sun cast its rays on the Blue Mosque. I don't know...I'm not convinced that this would be something truly relaxing for me. Relaxing to me is cabin, trees, cool breeze...the opposite of so many people on a cruise. I don't know, though, maybe one day I'll go for it! After seeing your face while you described summers spent at your family's cabin, I completely understand why that would be the place where you would want to relax! We're starting to think that our next cruise should be an Alaska or Arctic/Greenland one because those areas are changing so quickly. Thought I had left a comment! Michael always tries to persuade me to go on a cruise, but I am put off by the fact that everybody I know who recommends them is over 70 and I don't fancy being so restricted. Plus I don't want to turn into one of the tour groups of people from cruises, who have trampled over me and everything else in their way in European cities, when rational people suddenly develop a herd mentality!.. Still you are a nice kind sensible but adventurous person and your observations are very interesting.....maybe if we get another premium bond win I might try it!. Welcome back to Paris. You have been missed. Thanks for the "welcome back", Denise! It has been good to have a bit of time to catch up on things before leaving for Boston tomorrow. We were surprised by the number of young English families on this cruise. One family, whose daughter was probably around 7, has been cruising since before she was born. They were doing the 33 day (!!!) cruise, not the 11 day one like us. The woman told us that she starts planning her next cruise before she goes on her booked cruise. It reminds me of certain people ;) and their Paris trips.